Do you work for one of America’s Happiest Companies™? Find out. 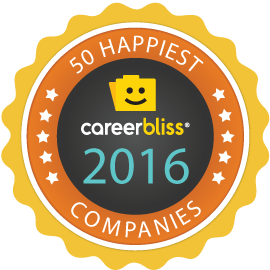 Today, CareerBliss announces the 6th annual CareerBliss 50 Happiest Companies in America awards list. We go straight to the source for our information. We analyze thousands of independent company reviews from visitors to CareerBliss.com to determine the companies that create the happiest work environments. Congratulations to UnitedHealthcare Ranking No.1 this year. The healthcare organization, based in Minneapolis, Minnesota provides healthcare services and insurance. Following UnitedHealthcare is Amgen Inc., Novartis, Nokia and Total Quality Logistics to round out the top 5 of the CareerBliss 50 Happiest Companies in America list. “Each year we honor the companies dedicated to creating positive work environments. Our judges are the people who work there and experience workplace happiness firsthand,” says Heidi Golledge Chief Happiness Officer and Cofounder of CareerBliss. Looking for a happier job in 2016? CareerBliss’ data evaluates the key factors that impact happiness at work including: One’s relationship with management and company CEO, compensation, workplace environment, growth opportunities, satisfaction with job role, and one’s overall workplace setting. The results are generated from CareerBliss.com review submissions and serve to provide insight into employers. All reviews are ranked on a scale of 1 -5. Data for the CareerBliss Happiest Companies for 2016 took into account reviews from 2014-2015.